Smallest: 3.2 cm H x 2.5 cm Diam. Smallest: 1.3" H x 1" Diam. 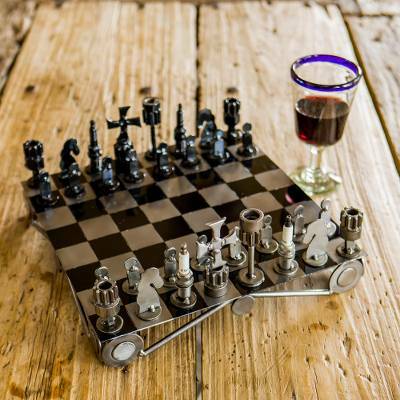 You can find auto part chess set 'Recycling Challenge' by Armando Ramirez in chess sets games categories such as Eco-Friendly Chess Sets Games, Nat Geo Decor Chess Sets Games, Recycled Metal Chess Sets Games, Steel Chess Sets Games and Chess Sets Chess Sets Games. Enjoy exploring these sections for other Novica treasures. This is an exceptional piece of Art! So pleased with my order! "For my son's bday, a National Master chess player"
To paraphrase my son's reaction: two Wow's, a Very Cool, and Awesome!! I only saw it online but loved the unique appearance and the fact it was made from recycled materials. Only issue that I have is I see it is now only a week later reduced by $36. That's a lot! This chess set was a present for my son who loves both chess and cars. He loved it. It is a unique and beautifully crafted set. Armando is a wonderful artist. "Perfect for the gear head in your life!" Ordered as a Christmas gift for my dad. Arrived a bit earlier than I had expected from the 60 day notice on the website. Beautifully crafted set, a real win on recycling automotive parts.